Use the deck of playing cards as a tool for Self-Transformation. Now stack the piles face up from Ace to King in bottom up order, and place them atop each other in the natural order of Hearts, Clubs, Diamonds and Spades. Turn the deck over and lay out the cards in a 7 x 7 matrix as shown to the left, going from right-to-left, and top down. Place the three remaining cards above the 7 x 7 matrix as indicated. 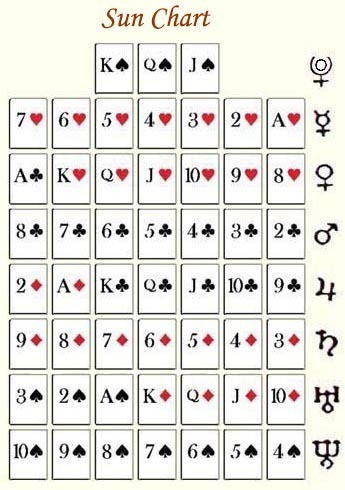 According to Richmond, the top row of cards represents the Sun line or Sun Cards because they do not rule under any of the planets. This means that they operate outside the influence of the 7x7 matrix that rests below it. Being exalted as it is, the top row of cards has come to be known as the crown line. Note how the crown line (represented by the Jack, Queen and King of Spades) loops back over the top of the Mercury line. Among other things, this reflects the fact that these cards are not in a linear pattern, but actually produce a spiral to where the King of Spades is followed by the Ace of Hearts. Richmond stated that the planets, Earth and Moon rule the suits based on their characteristic effects. While Mercury rules the Hearts from the standpoint of instinctive passion, Venus rules from the standpoint of emotional love and harmony. While Mars rules Clubs mainly from the standpoint of action and aggressiveness, Earth rules from the standpoint of selfishness and greed. While Jupiter rules the Diamonds from the standpoint of wealth, Neptune rules from the standpoint of commerce. While Saturn rules the Spades from the standpoint of death and rebirth, Uranus rules from the standpoint of labor. Later in The Evolution of 7 topic, additional suit/planet relationships will be discussed showing a slightly different orientation than Richmond indicated (as stated above). The crown line represents the contact point between our solar system and the cosmos as a whole. Thus, the crown line has the function of channeling universal energy and transforming it such that it can be cognized by our physical senses (the 7x7 matrix). Also, since Pluto was discovered after Mr. Richmond first introduced his study, it has come to mind that Pluto may be the appropriate ruler of the crown line. But scientists have always questioned whether Pluto was actually a member of our solar system, or merely one of many planetoids of the Kuiper belt just outside of our solar system. Through my own intuitive guidance, I have come to know Pluto as a universal principle rather than through its role as a planetary body. In this, Pluto operates as the ambassador of the Kuiper belt, and therefore represents our contact with the greater universe.